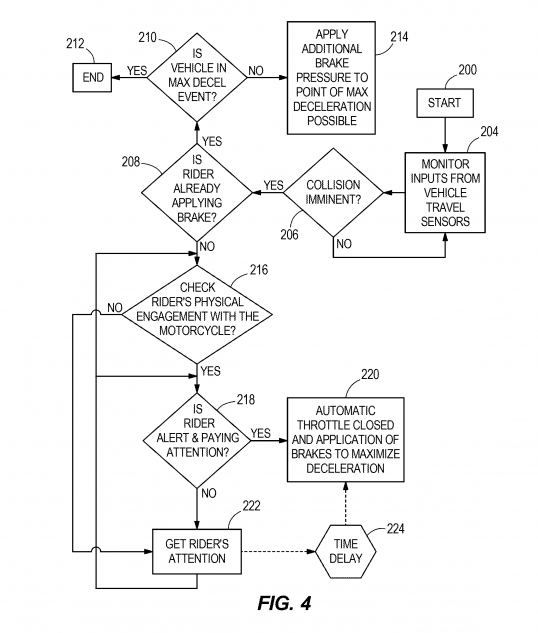 Harley-Davidson has filed a patent application for a rider assist system that autonomously applies a motorcycle’s brakes in emergency situations. Automakers have been employing autonomous emergency braking systems for cars over the last few years, but the technology has yet to make it to motorcycles, as abrupt braking can actually be more dangerous for two-wheelers. Still, companies are trying to find ways to make it work. We’ve previously reported that Honda is also developing an autonomous braking system for motorcycles, and companies like Bosch are no doubt working on their own solutions. The idea is relatively straightforward. Various sensors, such as cameras, RADAR or LIDAR, scan the vehicle’s path for any hazards that may cause a frontal collision, such as a car making a sudden turn or a deer running across a highway. A controller processes this data and, if it predicts an imminent collision, automatically applies the brakes, closes the throttle and actuate the clutch to slow or stop the vehicle before it can hit the hazard. On a car, such a system can work relatively safely, but on a motorcycle where a rider is exposed and not wearing a seat belt, sudden and unexpected braking can cause a rider to lose balance or even be thrown from the bike. Harley-Davidson’s solution is to use additional sensors to determine whether the rider is physically or mentally prepared for emergency braking. 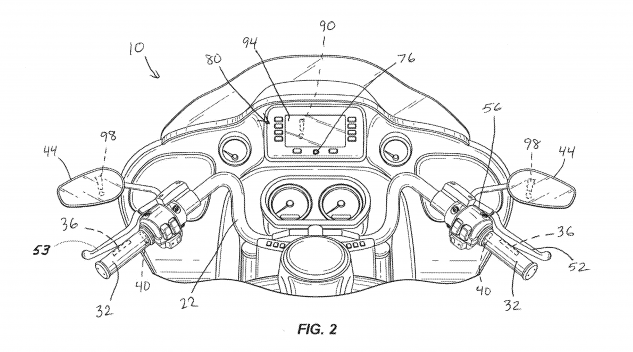 These include sensors in the grips to determine whether they are being held, seat sensors to check if a rider is not standing up on the foot supports, and cognition sensors mounted on the instrument panel or even inside a helmet to track a rider’s eyes. A rider cognition sensor (labeled as #76) on the instrument panel provides data that a controller uses to determine whether a rider is paying attention and thus prepared to react in an emergency situation. Sensors in the grips (#36) check to see if a rider is holding on with both hands. These rider monitors evaluate whether a rider is sufficiently prepared to react before the autonomous brakes are activated. If the sensors determine a rider is not prepared, the system turns on various warning indicators (illustrated above by the exclamation marks in the mirrors and digital display), audio cues or even a vibration from haptic indicators in the handlebars or seat. The system may also apply a brief braking pulse, applying the brakes just enough for the rider to feel a shift in the weight. 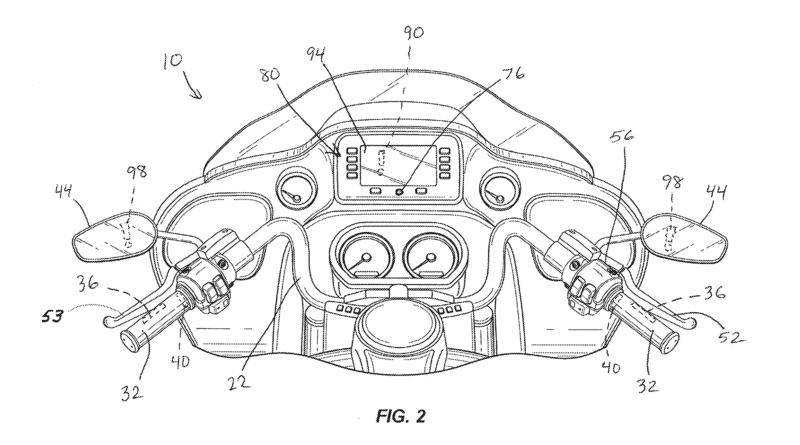 If the rider still does not respond, the system will wait a predetermined interval (the patent suggests between 200 ms to 500 ms) before stepping in and slowing down the motorcycle. If the system determines the rider is alert enough, it will start applying emergency braking. If the rider has already applied the brakes, the system will assist by applying additional braking pressure. An autonomous braking system still requires some fail safes. Sometimes, the safest response to a potential collision isn’t to hit the brakes but rather to take evasive maneuvers. 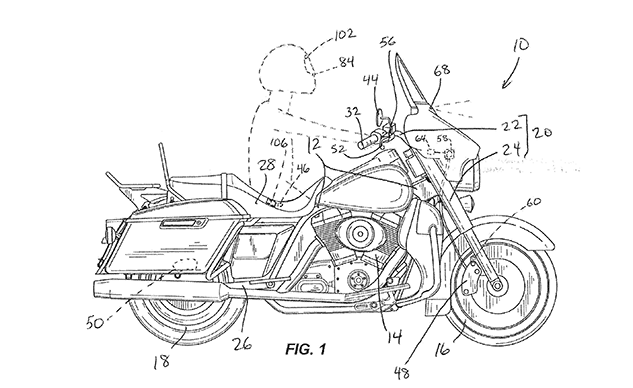 Harley-Davidson’s patent application describes how the autonomous braking system may be over-ridden if the sensors determine the rider has the situation under control and assistance is not required. As with all patents and patent applications, there’s no way of knowing if or when the invention may actually be used in a real product. Harley-Davidson’s patent application tells us the company at the very least considering an emergency autonomous braking system. Time will tell whether Harley follows through with this idea or goes in a different direction.